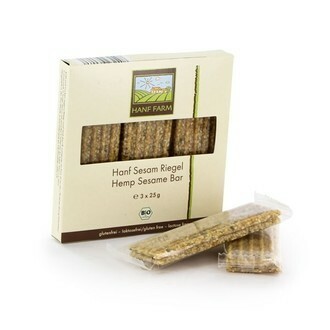 Hemp snacks, the healthy way to recharge your batteries. These cereal bars contain shelled organic hemp seeds, organic sesame seeds and organic honey and are full of protein and fiber. Both hemp and sesame seeds contain a big amount of unsaturated fatty acids which play a part in a healthy nutrition. A pack contains 3 bars, 25 grams each. 105 calories per bar. Gluten- and lactose-free.